Hi there, my darlings! 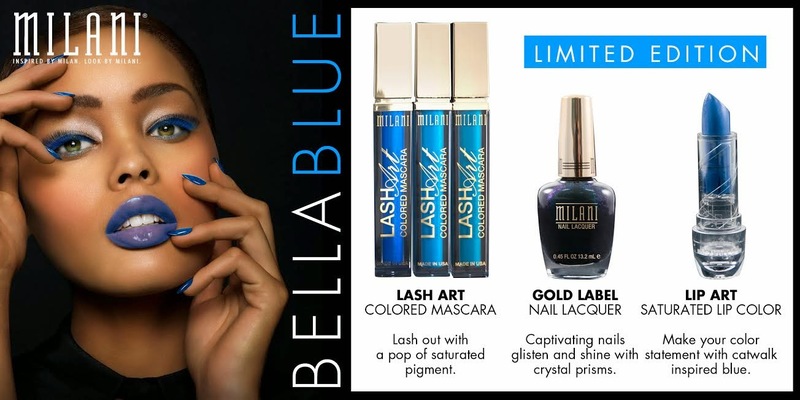 I have a funky little new collection to show you--your first look at Milani's upcoming LIMITED EDITION Bella Blue collection! Take a peek! "We are very excited to announce the launch of our Bella Blue Collection for Summer! This collection is available at select Walgreen, Kmart, and Fred Meyer stores this month." So there you have it, my darlings! I'm super excited about those mascaras! I think they would be just the perfect, unexpected pop of color to liven up your look! Do YOU like what you see? How do you feel about BLUE makeup? I'd love to hear from you in the comments section below!